Brand new 1 panel bath screen! The screen can be pulled or pushed. This screen will fit over ANY bath. Our 6mm thick toughened glass shower screens are almost TWICE as thick as most on the market. If you have not received your goods in 7 days after you made your payment, please notify us. 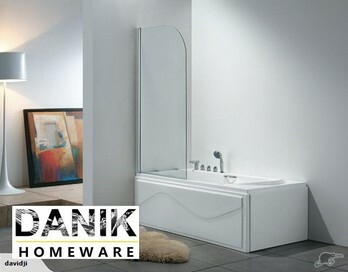 As a specialist in bathroom ware, Frameless Glass Shower, Lights and Shower Fittings, the Danik brand has been in Auckland 16 years was established in 2001. DANIK Homeware Co. Ltd is home interior designed ware supplier which sourcing affordable designer home furnishing products at very competitive prices directly from the manufacturer for all our customers. We aim to be a leader under sector by providing enhanced services that exceeds the expectations of our esteemed customer. And also mission to build long term relationships with our customers and clients and provide exceptional customer services by pursuing business. We believe in treating our customers with respect and helpful. We integrate honesty, integrity and business ethics into all aspects of our business functioning.